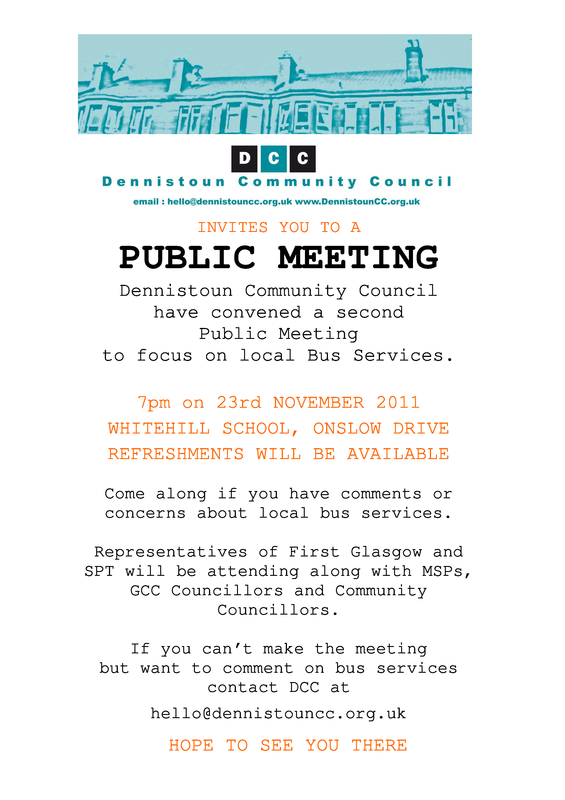 This meeting is a follow up to our previous public meeting about bus services, held last month. The meeting went well, but First Bus were not present. However, summary notes of the previous meeting, with responses provided by Alex Shearer (First Bus Commercial Director) are now available in the Minutes section, or by clicking here to download the PDF directly. At this meeting, First Bus will be sending four representatives who will be able to provide clarification on any answers to queries made thus far, and also field any new queries. SPT will again be attending. If you have any additional concerns regarding the bus service in the area, then please come along to the meeting and take the opportunity to get an answer, in person, from the team responsible for running the service. 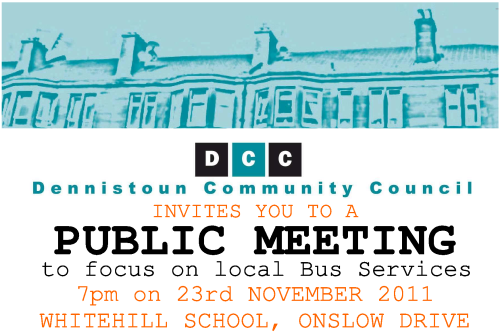 If you can’t make the meeting but want to comment on bus services contact DCC via hello@dennistouncc.org.uk, or add a response at the bottom of this page. There is also a discussion about the subject on the forum at Dennistoun Online (independent third party site, views unconnected to DCC). Forum discussion for the previous meeting is here. Click here for a large poster image.